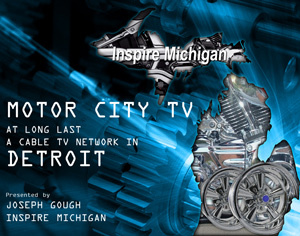 The INSPIRE MICHIGAN™ non-profit organization focuses on invigorating economic development in Michigan. In order to achieve our goal, we believe that our efforts must nurture innovation in the areas of education, technology, and entertainment. The entrepreneurial spirit of this state is alive and well and must be encouraged. Likewise, the creative community is an untapped resource with massive potential to propel Michigan’s economy. Our fundraising initiatives and event marketing agenda will differentiate us from the garden variety non-profit. By using dynamic public relations and providing innovative entertainment, Inspire Michigan will increase tourism and brand Michigan as a must-see destination. In the end, we hope to improve the quality of life for everyone who lives, works, or plays in this great state. Innovation– Inspiring people to think and act creatively in their personal and professional worlds. Education– Inspiring people to study emerging fields of study that will help transform our economy. Technology– Inspiring people to embrace the tidal wave of high tech opportunities that are growing every day in Michigan. Entertainment– Inspiring people to work and play in Michigan, so that we can all feel good about OUR state and our place in the world. By developing a spirit of collaboration and creating viable synergy between these four fields, we can and will Inspire Michigan.